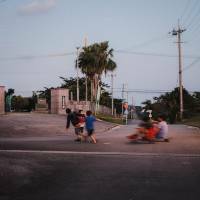 TAKETOMI, OKINAWA PREF. - Approaching the house of 80-year-old Akiko Ishigaki, a three-legged dog rises to signal our arrival. From inside the house, Ishigaki gently scolds the dog, emerges from the doorway and invites us in. She’s dressed in layers of woven purple cloth and her face maintains the preternatural youth Okinawans are known for. 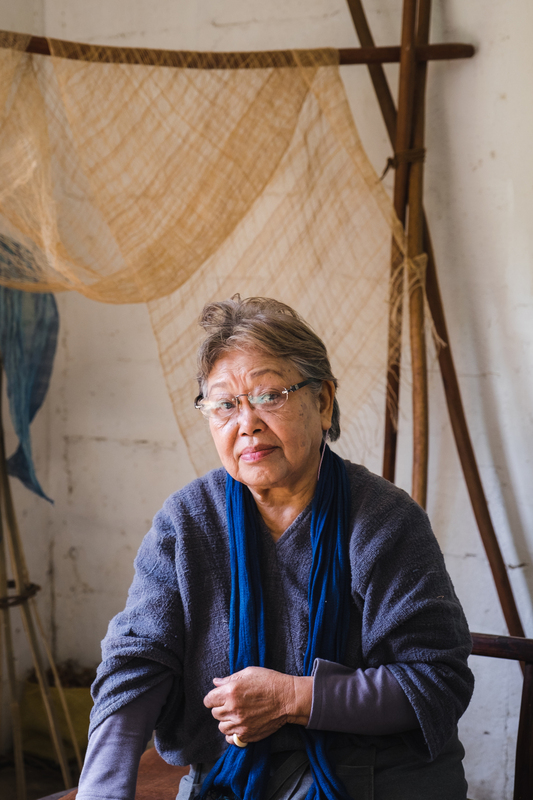 Ishigaki is a sort of matriarch on Iriomote-jima, one of Japan’s most remote islands. Over the years she’s cultivated a reputation is as an artisan, designer, local historian and environmental activist — an elder stateswoman. She seats us at a large wooden table that sits a level below the looms where a young assistant is weaving bashōfu into bolts of fabric. Bashōfu is a traditional textile made from itobashō (wild banana) leaves used to make summer kimono, an Okinawan specialty. Before the era of synthetic fibers it was one of the few materials able to wick sweat away and stay dry against the skin. Ishigaki adapted the traditional methods she learned in her youth, combining itobasho with other materials such as silk and producing more contemporary designs, ushering in a mini-renaissance for the fabric. Her vision has been to blend old traditions seamlessly into modern life, reconnecting human beings with their environment. Two chickens enter the room, clucking and scratching under the tables as Ishigaki pours tea. Her husband, Kinsei, smokes next to us, entertaining unexpected guests from his high school days. The sound of the loom keeps its rhythm. She continues her point, using their land as an example. “These mountains are our backyard. They provide water for the fields we use to grow what we need. The fields help feed the boars, birds and mountain cats. The water from the fields flows down to the mangroves and the ocean. We are a natural, essential part of that cycle,” she says. I ask her thoughts on Iriomote’s pending nomination for UNESCO World Heritage status and her tone changes. What they have is one of most pristine and biologically diverse environments in Japan. 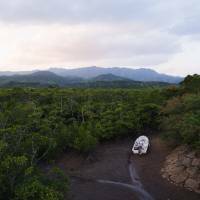 In February, the Japanese government submitted Iriomote Island for consideration as a natural site on the World Heritage list along with Amami-Oshima and Tokunoshima Island. A UNESCO listing would mean a boon to the local economy, but the increased exposure, especially to tourism from neighboring Asian nations, has most of the 2,300 residents of Iriomote anxious about losing control of their environment and independent way of life. “We don’t want convenience culture here. But when boatloads of tourists start coming ashore, 10 times what we have now, that’s what we’ll get. 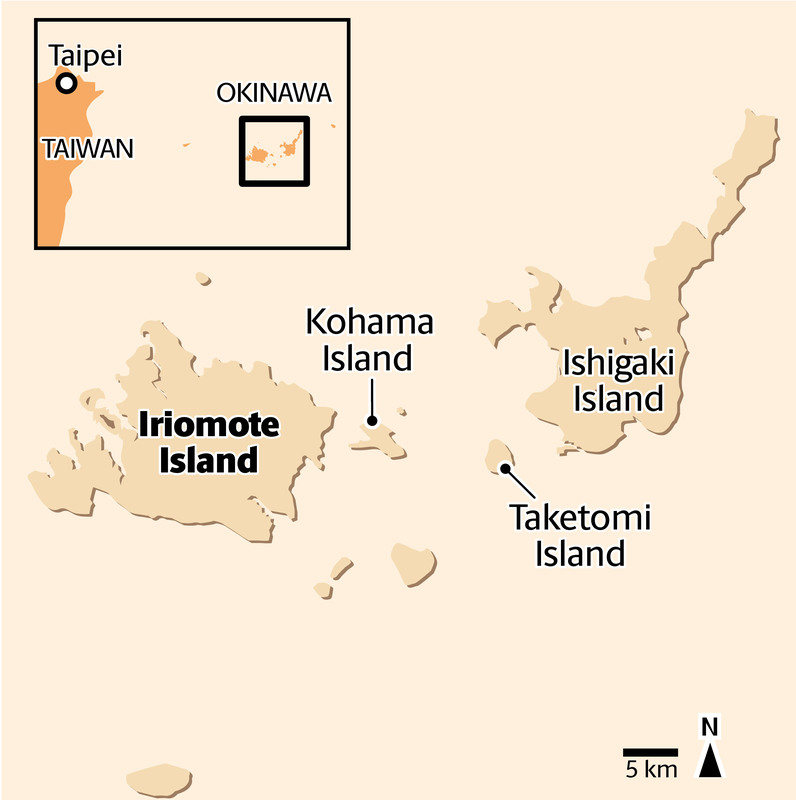 Convenience stores, big hotels, light pollution and littered shores,” Ishigaki said. 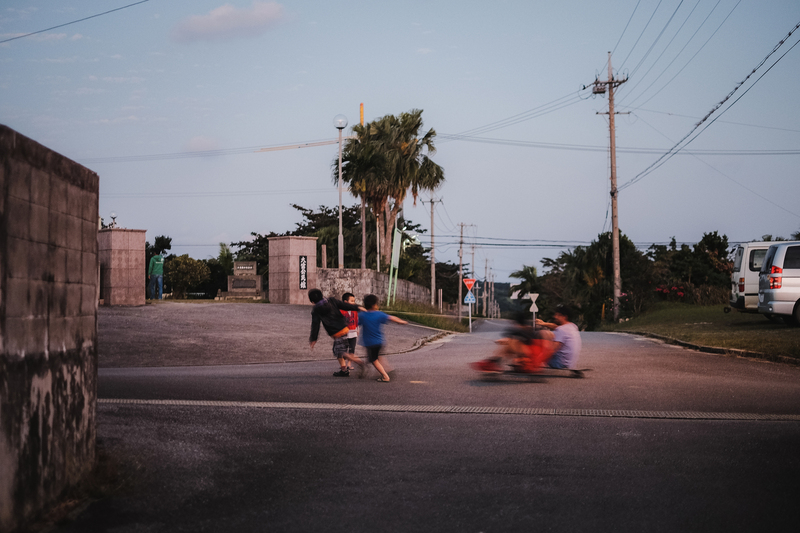 Like many on the island, the Ishigakis consider the Ryukyu Islands as a separate “country” from mainland Japan. They welcome tourists who come to appreciate nature and enjoy the natural beauty, but most want to maintain autonomy and control. Leaving the Ishigakis, we drive south along National Highway 215, the only road, which traces the northeastern shore. With the windows down, the smell of sea breeze and tropical vegetation fills the vehicle. Yellow road signs emblazoned with leaping Iriomote cats warn drivers to slow down to protect the island’s most famous and elusive animal. Hills covered in dense forests scroll by. Intermittent breaks allow staccato views of the ocean below. It’s difficult to imagine these mirrored waves receding each night with the tide, exposing mangroves and living things adapted to that environment. We see a mosaic sign with the word “Mana,” the name of a farmhouse run by a husband and wife team, Kazuyoshi and Takako Ishihara, who are transplants and relative newcomers to the island. Like most who live here they do what they have to, running a bed and breakfast, hosting tourists and farming vegetables. The Ishiharas show me to my room and suggest I watch the sunset before dinner. I walk alone along the single road and watch the scene from an overpass. In the mangroves below, a stranded white fishing boat casts an eerie presence in the dimming light of the evening. The sun falls behind the forested mountain peaks and a red-violet glow envelopes the island. It feels incredibly far away from the rest of the world. I return for dinner. Two seasonal workers, Ryoko Imada, 36, and 69-year-old Takashi Matsuda, join us. Each February, they return to Iriomote to work on the Ishihara’s potato farm before leaving for the rest of the year. Matsuda says he comes here for catharsis, not economics. “Iriomote refreshes my heart. I’m retired and don’t need to work. I come back here to refresh. And when I go back, I feel I can make it through another year of anything. The nature heals it all, mind, body and spirit,” Matsuda says. Dinner is served and he offers me a tincture of turmeric he pressed himself from roots grown on the farm, which he claims will prevent any hangover. On cue, Kazuyoshi opens a bottle of sake made especially for his 50th birthday, his name engraved right into the bottle. The line of sake descends the side of the bottle, our simple dinner of fish, vegetables and rice dwindles; bellies fill and faces turn red. Kazuyoshi explains how he and Takako ended up living here. “We wanted to make our own food, work for ourselves, and know all of our neighbors. We considered other rural areas in Japan, but after finding this property, we knew we had to move here. There’s a magic here,” Kazuyoshi says, finishing off his glass. It’s decided that in the morning Matsuda will take me to the coast to see the sun rise and watch the tide come in. In the room, I leave the windows open, the complete darkness combined with the sounds of nature are jarring. The night is alive. I focus on the layered sounds of insects, frogs and birds. The warmth of the sake lulls me and finally I drift off. Before dawn Takashi and I don rubber waders and windbreakers and follow the trail toward the seaside. 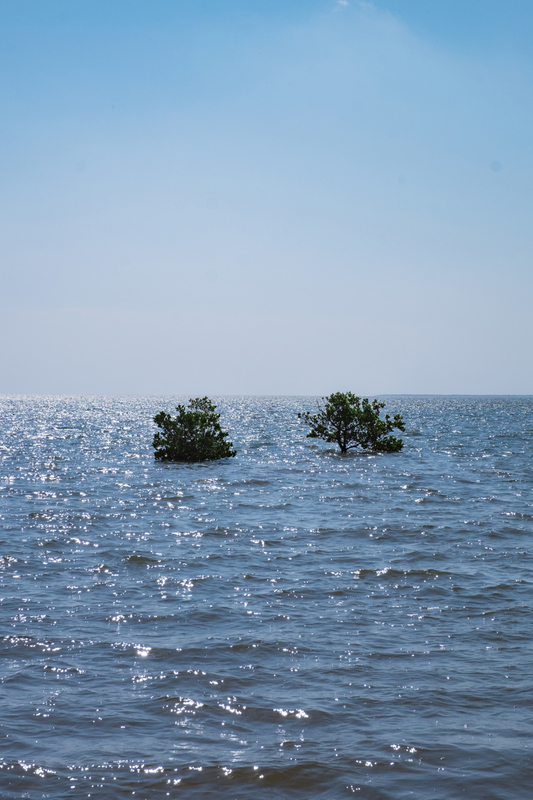 When we reach the mangrove forest, the exposed roots and waterlogged sand make walking difficult. A closer look reveals a graveyard of bleached shells and tiny exoskeletons under our feet. Crabs and insects dart in and out of makeshift homes, bringing the seabed back to life. We walk further out into the exposed seabed. The purple pre-dawn sky gives way to pink and fiery orange. The horizon shimmers and approaches the shore, pulled along by the force of the rising sun. The final evening I stay at Takemori Inn, one of the islands few ryokan (Japanese inn). My friend and fixer for this trip, Aoi Suzuki, and her husband, Ikkei, invite me to join them for a dinner party at their nearby home. A small eclectic group of local 30-somethings, hippies, surfers and dreadlocked backpackers straggle in to join the party. Other than Aoi and her son, none of them were born on Iriomote. Ikkei Suzuki is a transplant from Shizuoka. 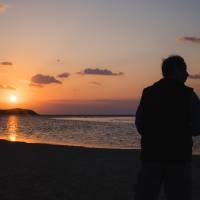 He came to Iriomote as a surfer and stayed. First working the sugarcane and pineapple fields, he now runs his own surf and nature guide business for the ever-increasing number of tourists. He is preparing taco rice and sashimi. I ask him why he chose to settle here and he answers with conviction. He nods toward Soushi, who is toddling around the living room. “My son. He is the new Iriomote. He will be the one to make the new culture here. No nationalities. No government. Just an open-minded community — a big village — where everyone is welcome,” says Suzuki. For the rest of the night we dance, talk, and listen to reggae and hip-hop records on a turntable. 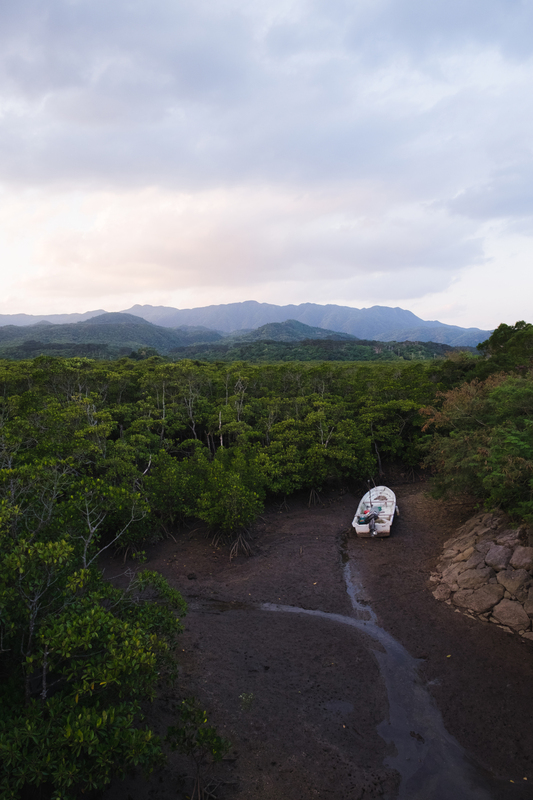 For this new generation of pioneers, Iriomote is a frontier. A place that simplifies modern life down to its bare essentials, where people respect nature and protect it from the outside world, yet welcome anyone who can recognize Iriomote for what it is: one of the last paradises on Earth. 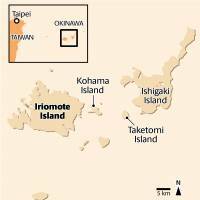 Iriomote is accessible via ferry from Ishigaki Island, which can be reached via New Ishigaki Airport. Ferries take 40 minutes and cost about ¥2,000. 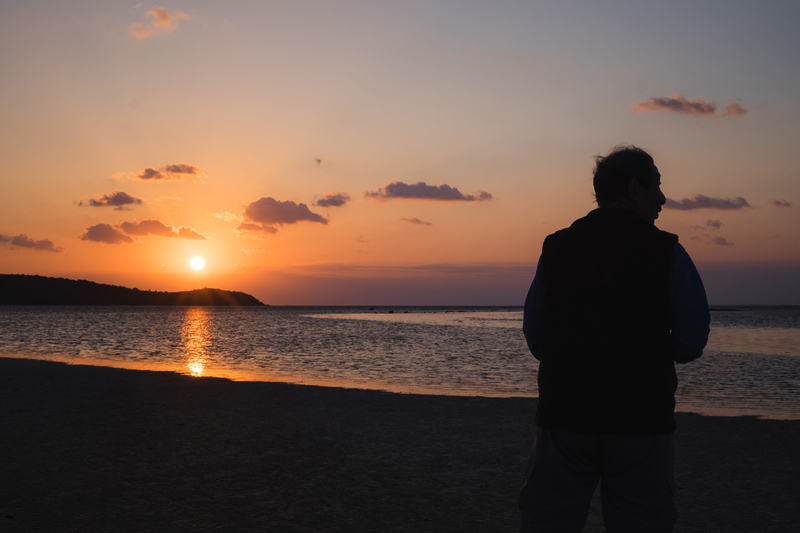 Bus service runs five times a day, but consider renting a car in Ishigaki. Mana Farmhouse (www.facebook.com/mana.iriomotejima) and Takemori Inn (www.takemori-inn.net) offer shuttle service to and from the port for guests. Surfing, SUP and guided eco tours can be booked with Iriomote St. East tour company (ise.festivalexpress.net).